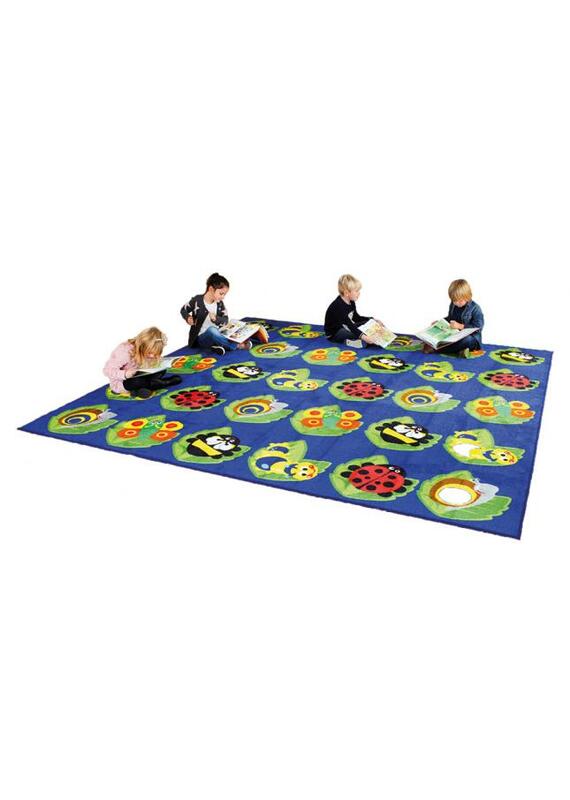 The Back to Nature Bug Square classroom rug is a brightly coloured square carpet with each placement area identifiable by a different bug on a leaf. The fun and interactive educational rug allows children to learn about minibeasts with 30 clearly defined placement spots for children to sit on. Perfect for group reading, play or interactive group games. Manufactured using a premium quality carpet with an extra thick, soft textured Nylon tufted twist pile which meets heavy duty laboratory pull tests. Designed for longevity and comfort, it features a specially designed anti-slip Rhombus backing to ensure safe use on all surfaces. Our classroom rugs conform to relevant safety standard EN71 Parts 1,2 and 3 and come with a 1 year manufacturer’s warranty. The Back to Nature classroom mats are crease resistant and feature tightly bound edges to prevent fraying. Easy to clean, our stain resistant classroom rugs can be spot cleaned with a damp cloth.